I always like saying that about Kuku. For those of you who have not had this particular Persian dish, it is somewhat comparable to the Italian Frittata or the French Quiche. I say somewhat comparable because while it is considered an egg dish, unlike in a Frittata or Quiche the eggs are not necessarily the main stars of Kuku. In this dish the veggies that are used play the primary role and the eggs keep it all together. There are several different Kukus in Persian cooking. I would like to start with this one because I only had it for the first time a few years back and it was delicious. I got the idea for this dish from the cookbook New Food of Life. I have changed the amount of the ingredients used in it, because I am a rebel and consequently, it made the dish much better. All right let’s get started here…to think of it, you might want to pour yourself a glass of wine here…you’ll see why as we proceed! Aaaww look at the beauty in the picture above! I have to tell you a little secret. In theory you could make this dish with dried dill, but do me a favor, don’t! Fresh dill does wonders to this dish and the smell of it while it cooks will tease your nose to no end and make you hungry! You see this whole bunch? I used it all, oh happiness! Sauté onions and garlic in olive oil until nice and golden. In the mean time cook lima beans per the package’s instructions. Don’t forget to add a little pinch of salt! I used frozen lima beans but wished that I had fresh ones. During this time give your dill a nice rough chop and set aside. Once the lima beans are ready drain them in a colander and gather all of your ingredients around you. First crack your eggs in a mixing bowl, add salt, pepper, and baking powder. Give it all a nice mix to incorporate and break the yolks. Warm up your pan and melt 1 tbsp of butter and throw in your mixture. From this point forward the name of the game is patience. Cover the pan and cook on low for about 15 to 20 minutes. Once you notice that the mixture is firming up make a cross dividing the mixture into four pieces. This is going to help with the flipping process. Now I have to tell you that in my kitchen all was going well. It was a nice and sunny day outside, the birds were singing, the woodpeckers were pecking in the trees across the street ( no joke we have them around here! ), and the smell of the Kuku was totally flirting with my nose. I flipped the Kuku and…. This happened. Now I can only attribute the disaster above to 2 specific reasons: 1) over confidence/ ambition, and 2) khareeat, which in Farsi means being or acting stupid! You see I was being all snazzy and cool and I decided to make the kuku in a cast iron pan whereas I should have used a non-stick pan. Just as this was happening Sleeping Beauty The Sous Chef walked it and said: “Wow what happened? !” “Um, yeah, disaster happened.” Suffice to say though that while the result looks pretty pathetic, the taste was delicious –it was gone as soon as it left the pan! I made sure to take a picture of it for you so that you won’t make the same silly mistake. When I was much younger I was terrified of failure. I am not saying that I am no longer afraid of failing, but what I am saying is that life is all about winning some and losing some. It is also true that the taste of success is THAT much sweeter when you have failed before. You see, I am stubborn and resilient –bent me out of shape and I will spring right back up and fight back. So after the disaster I purchased the necessary ingredients and went at it again. All was going well until I was taking the chopped onion and garlic to the pan to dump it in there as the oil was ready. Then somehow my flexible cutting board gave out and half of the onions fell off onto the floor. Some explosive words may have flown in the air while I looked at the mess on the floor in bewilderment. Is this damn recipe cursed???? Remember the comment about resilience? I said screw it, I am taking a picture and I am going forward. I cut up some more onions to replace the ones I lost and went back to work. Backing up a little to when you warm up your pan. Please use a non-stick pan. Put in a tablespoon of butter and let it melt. Then add the egg mixture, cover and cook on low for about 15-20 minutes. Divide the mixture into four portions and carefully flip each section while at the same time slipping a little butter in the pan. Your first slice is not going to be easy, that’s for sure. As you can see above mine got a little messy with some of the mixture flying onto the stove. Cook this side for another 15 minutes or so. Remove from the pan, place in a plate and serve warm. Phew, I am so glad this recipe is done and over with! We almost didn’t make it, twice! Kuku can be served either as an appetizer or side dish. This is a gluten free dish –simply make sure that your baking powder is gluten free. Thank you for stopping by AND leaving a comment! I hope you will make some of these dishes and share how they came out. I just made a version of this today. It’s one of my favorite comfort foods. Cook the beans as the package tells you. Brown the onions and garlic, add beans, set aside. 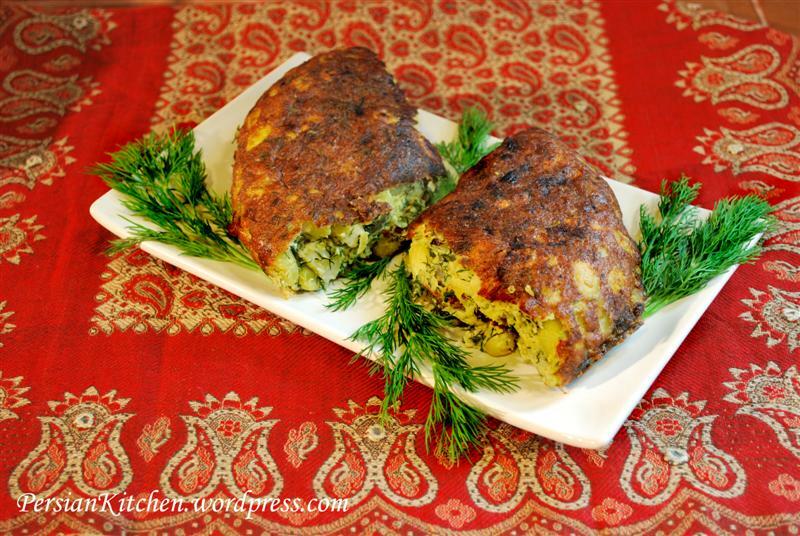 Mix eggs, salt, pepper and baking powder, beat thoroughly, add dill. Pour 1/4 cup olive oil into 8 x 8 pyrex baking dish and put in the oven for about 5 minutes. Take out the dish and pour in mixture. Bake uncovered on middle rack for 30 minutes. Then pour remaining olive oil over the top and bake another 30 minutes. Garnish with plain yogurt, Nush-e jan! I just want you to know how excited I am about your blog. I married a persian (well half persian) 14 years ago and I am proud to say I have mastered several dishes which my Father In-Law really enjoys (which makes me happy). My Husbands Uncle would not try my cooking at first but once he did he always made great comments about it and wanted it often. I love the fresh ingredients and the wonderful smells I get from cooking. I love the fact that you make Persian food. My husband, aka the Sous Chef, is not Persian and he makes some awesome Persian food. It is so nice to be married to someone who appreciates your food enough to actually make it. You go girl! Yay, thank you for that recipe! I pilfered your photo of the Kuku for a post of mine, I hope this is OK. Let me know if it isn’t and I’ll remove it. No worries for using the photo. Thanks for the heads up and the link back to my blog! I made sabzi-kuku the other night and my aunt always flips the whole thing by first sliding it onto a plate, it’s really easy and I have never had an oops moment when using that technique! We tried with my husband (he is Persian) to make kuku for few ties, but each time sth. was wrong. Finally, after consulting sb. more experienced it was better. But when we bought good pan, all got in the right way finally!!! My favourite was zucchini kuku so far, but this one also could be on my list! Mirosix, a good pan does make a difference. I hope you try the lima been and dill kuku, it really is delicious! Could this be served as a breakfast?